Melt ponds anyone? Or how about some rotten ice for your Martini? There are a couple more videos like this one (here and here). And here's one showing the Polarstern. The results reveal that radiation emitted by the ice allows SMOS to penetrate the surface, yielding ice-thickness measurements down to 50 cm – mainly the thinner and younger ice at the edge of the Arctic Ocean. “The amount of thin ice expected during the next freeze-up is about 12 million sq km, covering a larger part of the Arctic Ocean than ever before,” said Lars Kaleschke from the University of Hamburg’s Center for Earth System Research and Sustainability. For a more detailed look at thick sea ice and ice shield thickness, ESA’s dedicated ice mission, CryoSat, uses a different technique and higher resolution along its ground track – about 300 m.
Read the rest of the press release at the ESA website. Another cool video that hasn't been uploaded to YouTube (so I can't embed) is in a NOAA ClimateWatch Magazine article from three days ago, discussing this year's melting season and the declining trends of multi-year ice and sea ice volume, with accompanying animations. Edit: a commenter has uploaded it to YouTube. "Q: Yngve [Kristoffersen], you were very long out here during the new ice minimum. How did this extreme ice recess appear to you? A: (I noticed) especially the very warm air temperatures. I really hadnt counted on this: it was so warm that my fresh food turned bad (victuals). Usually, I just put them outr there in chests, nature cares for the cooling. But we had severe plus-centigrades, and the vegetables just didnt keep themselves. Also, the ice has gotten very soft, one coud see it strongly melting everywhere. And it rained, even in the middle of September I experienced incredible rains, (it was) as if I would be back in the mountains." their english blog is actually very good reading too! I enjoyed the video that came up after the first one finished! Am very interested in slogans/texts regarding the Arctic sea ice as prelude to catastrophe. The best I've gotten so far came from a commenter here (paraphrased) "We should reflect on the arctic ice because pretty soon the sun won't be." Great stuff. Need more. You wouldn't believe what I can do with cardboard, paint and an overhead projector. The end of the second video simply shows the mid September melt outline well in advance in February. 2012 was essentially a melt of the thin ice present at Maxima. The red thin ice in February also outlines the tracks of Southern in origin cyclones which penetrated Arctic Ocean fortress winter almost at will. That NOAA ClimateWatch Magazine video has just been uploaded to YouTube, so you can embed it now, if you want to edit your post. Fortunately, US Gov't products are public domain, so I shouldn't get in trouble for uploading it to YouTube. Export through Fram Strait. This has been going on for a long time, I guess, so it alone does not explain the loss of MYI. Increased melting of FYI. There isn't enough FYI anymore at the end of summer to replenish the flushed out MYI. Increased melting of MYI in the Beaufort Gyre, first in the Chukchi and Beaufort Seas and later in the East Siberian Sea. This vipes out the Pacific side MYI that is immune to the lure of Fram Strait. Thanks, Steve C! I've updated the post. "It's not your father's Arctic--and still less, your child's." "Someone mentioned these while I was away"
That would have been me Neven! In view of the current circumstances I wondered if I might enquire what you make of my use of the ice thickness video (amongst others) to try and enlighten the folks over here in South West England about what's going on? ....is behaving as expected, given the new low attained in September. Should we expect the extent to eventually match other years in the past decade in January through March or will we see a shift downward in maximum extent? I catch your comments on Atrios periodically.....hang tough. As a newbie here I ask a question that I hope is not too dumb. I would hazard a guess that first year ice (I guess that is FYI) is not as thick as multi year ice, thus making it easier to melt and get mushed up in the arctic storms. So my question(s) is: Did the little bit of rebound in years 2008-2011 due to the multiyear ice left in the refreeze season, or was it the weather that caused what little rebound it had? And, is it possible to see the same rebound the next few years? You'll probably get a few opinions here, but my take on the data is that 2007 was exceptional because of exceptional weather (superimposed, of course, on a long-term declining trend). The "recovery" that followed in 2008 and 2009 was simply a "dead cat bounce" back toward the trendline, perhaps enhanced by somewhat cooler weather in those years. The arctic really, really wants to freeze and stay frozen, but that tendency is being overwhelmed by the changing climate. This year was not driven by particularly exceptional weather, it was the result of the long term erosion of the ice volume (a steady decrease in the multiyear ice that you mention) brought about by a dramatically warming arctic. So its hard to say what will happen next year. If it's a warm year, the record could be broken. If it's cool, or the wind blows the ice around at the end of the season, we could see a somewhat greater extent. No matter what the extent does, one thing is almost certain: there will be less ice volume next year than there was this year. Mary, 2008 maxima was exacerbated by a cool La-Nina which reduced clouds at the North Polar region. There can be severe winters again in the Arctic, but the timing of - AO must be just right. No clouds during the long dark night is essential, several years decline must be compensated by several years recovery, the odds of refurbishing the ice to former health over a decade is quite low though, almost impossible. I too am a newbie and therefore won't answer your question. It took me a week to realize that NH did not stand for New Hampshire! I think Neven would be doing a great service by listing the top 100 (200?) acronyms with simple definitions. What does CAB stand for? Encourages further incursions of low pressure cyclones from the South. Which bring heat, so somewhere South of the Arctic they will complain "its cooler". All while cyclones keep the Arctic warmer. The shape of the surviving ice pack is not conducive for a quick refreeze. Doesn't look good for a 2013 recovery, only La-Nina may play a role. wayne, I've been betting on a slow recovery too, but right now the dice are still rolling across the table. Thank you for your valuable input. And Conrad, I am still trying to figure all those acronyms; although when I do finally figure them out I think(hah) that I am just 1% smarter. And yes, it took me a while to figure out NH. FYI also has a higher salt content than MYI, and whilst this means that it melts at a marginally lower temperature, it is mechanically weaker. MYI - Multi Year Ice. DMI - Danish Maritime Institute? Neven, perhaps you could open a thread that would allow regulars here to contribute to a list of our most commonly used bits of gobbledigook? Finally, at the top of the page, there is a "Glossary" tab, which links to a very good list produced by the National Snow & Ice Data Centre. Mary, NH is mostly important when figuring out how to talk the graphing toys oriented towards showing either El Nino or U.S. into showing the Arctic instead. Of course, then they say "Northern Hemisphere." See, I knew someone mentioned them. Thanks again, Jim Hunt, and sorry for the delay. That's a very nice post you wrote, Jim. Videos are always good. You could perhaps put up a vid with Dr Jennifer Francis to explain how disappearing sea ice is actually influencing the jet stream and thus UK weather. BTW, I've added Andy Lee Robinson's latest 3D volume video to the post. Jim, I agree with Einstein, "God doesn't play dice with the weather" :). There is chaos in the smaller regions of the world, but even then this chaos is like musicians in an orchestra, they play in a beautifully synchronized natural sequence. Somethings are easier to predict, Arctic sea ice being one of them. Unless the land coastal areas freeze very fast and suddenly due to Siberian hyper cold weather, it will be slow, so far, land snow extent shows all the signs of the Northern continents in a slow refreeze mode. So I leave the dice for casinos and check constantly if I understand the future. It's possible that the 'glossary' tab on the top line might prove useful. FYI isn't just thinner, it also contains a lot of salt. The brine channels allow melting at lower temperatures and make it far more susceptible to mechanical breakup. Another fairly recently discovered factor is that because of the high salt content, the melt water sinks to about 200m, stirring the water layers and not allowing a freshwater lens to form a thin skin above that's available for quick refreeze. Old MYI used to be advected(transported) through Fram Strait, then when Nares Strait started opening on a regular basis a lot of the oldest ice advected through that channel. Most recently the CAA (Canadian Arctic Archipelago) - the passages between islands in the Canadian north - opened at the end of the 2011 melt season and this year the old MYI found a new way out through this labyrinth. "Found a new way out", is probably inaccurate because what we found was that as the MYI moved into this area it simply melted away. Ellesmere Island and above the CAA. Today all these areas are open to advection so MYI is either advected to warmer climes, or is melted as the Beaufort Gyre sweeps it into the now warmed waters north of Alaska, the Yukon and Siberia. Atlantic currents, western storms, lowered albedo (reflectivity, changing weather patterns and the mixing effects of winds on the open water are all probably much more important feedbacks to the temperature rise that increasing GG (Greenhouse Gasses) provide, but the loss of MYI, at least in my opinion is reason enough to preclude a return to the Arctic that existed as recently as a decade ago. wayne, I think he was completely wrong about it. The fundamental nature of existence is pure chaos. We invent rules attempting to describe this chaos. Some descriptions are more useful than others. Thanks to all for helping with the acronyms. And thanks for not making me feel like a really stupid person. Jim, Einstein being wrong is an OK concept, he was a few times incorrect, he was very human, and somehow us humans can come up with perfect things or concepts. I think he used God as a metaphor in this case. But I predicted many many events right especially this year, so much for chaos. It is a matter of focus, study and being in synch with the subject you study. Atheists are too certain, absolutists, and therefore are wrong by their stance. Should we expect the extent to eventually match other years in the past decade in January through March or will we see a shift downward in maximum extent? The way I have heard it explained here before is that the Arctic Ocean is largely land-locked, so when the Arctic Ocean freezes, in most directions it can freeze only up to the land's edge. So even though winters warm more rapidly than summer or fall you are not going to see much of a downward trend in winter sea ice extent for a while. But the Southern Ocean is also seeing a freshening of the surface water due to continental ice melt. The fresh water has a higher melting point than the saltier sea water below, and given its lower density, it is resulting in greater stratification, so that the saltier, warmer sea water below has less of an effect on surface sea ice formation. And even then, most of the Southern Ocean is actually seeing a decline in sea ice. The majority of sea ice growth has been in the more southern Ross Sea, where the East Wind Drift carries much of the fresh water melt from the West Antarctic Peninsula. Thus even though the Southern Ocean isn't land-locked, there has been a small upward trend in sea ice. Is nobody else having problems with the SMOS thickness retrievals? Here is a still of the Feb 2011 and 2010 thickness plots from the video. Here is the PIOMAS thickness plot from gridded PIOMAS data for Feb 2011. 2012 data is not yet available. 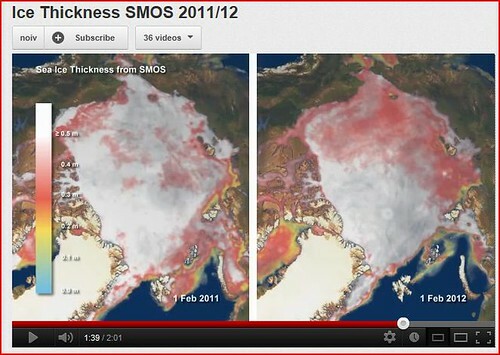 The SMOS 2011 image when compared to PIOMAS seems to imply much thinner ice. For example, in Beaufort PIOMAS shows thinnest of around 1.5m, yet SMOS shows around 0.4m! For the rest of the Arctic it's hard to say, as SMOS only goes up to 50cm, but there's a lot of pink in various regions implying <0.5m in areas PIOMAS shows just below 2m thick. PIOMAS may be smearing the thickness somewhat, as the points are average thickness of each grid point. Bear in mind that the SMOS thickness plot states it's for Feb 2012 - after the ice has done much of the thickening after the rapid growth in autumn. If we take 2011 as typical for PIOMAS - it's thinner than typical, then how come SMOS is showing much of the Arctic as pink shades - around 0.4m thick. Only a year before PIOMAS was reporting just under 2m thick! It's also worth bearing in mind that the loss of thickness for PIOMAS over March to September 2011 is of the order of 2m. Plot. The Kaleschke et al 2010 paper is here. Thanks for your kind words Neven, and thanks for your suggestion too. I am familiar with the Jennifer Francis video(s) you refer to. However in this instance I figured they might be a bit too "sciency" for my assumed audience. I also wanted to get a Met Office vid in there somewhere, not least because the Hadley Centre is within cycling distance of where I'm sat typing these words to you. I'll certainly post one or more videos of Jennifer in the near future. Have you seen these? Rather than leaving it at that, I should have mentioned that ocean has greater thermal inertia, and therefore warms more slowly than land. Since the bulk of the earth's land is in the Northern Hemisphere, we expect to see the Northern Hemisphere warm more quickly than ocean. This is the physics which is getting captured by the models. Since the bulk of the earth's land is in the Northern Hemisphere, we expect to see the Northern Hemisphere warm more quickly than ocean Southern Hemisphere. Several people have wondered at what made 2007 different from 2008-2011 and 2012. I suggest looking closely at the eruptions of volcanoes in the Alaskan archipelago, in Alaska and Kamchatka. Cleveland and others erupted in the sporting and summer just in time to throw aerosols into the Arctic to disrupt the melt. These can happen any year. A lot of them erupted in 2008 - 2011. Add we approach 2015 and the first ice fee Arctic summer, these can be importamt. That last should read 'spring and summer'. My spell checker was overly helpful. you are absolutely right! Don't take the SMOS ice thickness as absolute value. There are large uncertainties and the thickness has always a low bias if there is thick ice (>0.5m) in the field of view. "We suggest that the retrieval should be interpreted as a lower boundary of the thermodynamic (i.e., modal or level) ice thickness." With SMOS you can not distinguish if the ice is 60 centimeter or 6 meter thick because of the saturation of the emissivity (see Fig 1). There you see the so called "modal thickness" is about 3 meter but the average thickness is larger because of the shape of the distribution. "It has been shown that the measured L-band brightness temperature can be clearly related to the sea ice thickness for ice not thicker than half a meter. However, since it is not a direct measurement of thickness and the algorithm includes several assumptions, there are potential uncertainties. At first, the retrieval is influenced by open water and leads within ice cover. Because we assume a 100% closed ice cover, the ice appears to be thinner if open water is present. Secondly, the brightness temperature is influenced by changes of the ice temperature and bulk salinity. Thirdly, the brightness temperature is influenced by a snow layer on the sea ice. Despite the remaining uncertainties with respect to the absolute SMOS thickness, we can state that Arctic sea ice became significantly weaker between the years 2011 and 2012." So, please be careful with the interpretation and comparisons to other data. Sea ice thickness is not always the same sea ice thickness. There are many thicknesses: mean thickness, modal thickness, effective thickness, and now we also have the "SMOS thickness". You have to take it qualitatively until we have more validation data which are very sparse. Thanks for the guidance, and for your work on this. Don't know how I got the wrong paper - Doh! Given your finding of significant weakening from 2011 to 2012 it will be interesting to see how the PIOMAS gridded data reflects this when it's available next year. And indeed what next year's melt season is like. If Earth were a coal mine, the polar bear would be our canary. I like to play with words, so how about? Global Warming: Coming to a theater near you soon! Though, my first impulse is Climate Change! Feedback welcome. Positive or negative! Have you read my blog posts on the connection between the Arctic and UK's cool, wet summers since the crash of 2007? You'll find the first Summer Daze post outlines how unusual this pattern is. There is more to it than Dr Francis's work on Arctic Amplification affecting the jetstream. However it seems to me that on top of this we've been having more lows that sit over the UK and dump large amounts of rain over the country. Lows normally (used to??) seem to me to move over the UK as a rule, not just sit there. That could be due to Francis & Vavrus finding a larger persistent kinks in the jetstream. However in summer the low pressure tendency outlined above is itself due to a standing wave driven by the effect of the Greenland high. I'm relatively new here, and so I'm afraid I hadn't read your "Summer Daze" before. Thanks for the link, and now I'll have to go away and read up on the Greenland high and standing waves. As you so delicately put it - "Is this a coincidence? Is it F..."! I suggest "Winter Isn't Coming"
Real Climate posted a first of 7 parts topic about a 7-set video on Climate change, evidence and effects. On a not wholly unrelated note, I've recently been involved in a heated debate on the merits or otherwise of wind turbines on the ThisIsDevon web site, over here in South West England. Even David MacKay has also passed comment! I thought I'd pass it on, just in case anyone else here has strong views on such matters. Seke Rob: "Real Climate posted a first of 7 parts topic about a 7-set video on Climate change, evidence and effects. Nice shows. You can see all of them simply by not doing anything when one ends. In general, I think they overstate the state of our current understanding, and thereby tend towards a somewhat more rosey picture than is warranted. Forecasters say Sandy is similar to another late October storm - when several weather systems, including a hurricane, combined along the US Atlantic coast in 1991, leading to what was dubbed "the Perfect Storm". Hi Geoff, please continue at the latest post: Looking for weirdness.